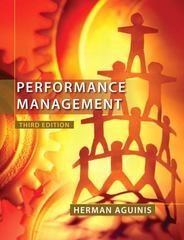 Performance Management 3 Edition Discover where the real success in business can be found. What makes some businesses more successful than others? The answer: people. Organizations with motivated, talented employees that offer outstanding customer service are more likely to pull ahead of the competition. Performance Management is the first text to emphasize this key competitive advantage, showing readers that success in today’s globalized business world can be found, not in technology and products, but in an organization’s people. The third edition includes updated and current information, and features over forty new cases.